To keep it out of the hands of America's enemies, and out of the human environment, DOE employs a highly specialized security force that transports and protects the material. The plutonium will be carried to the SRS by DOE's Safe Security Transport, an agency that moves all the nation's nuclear weapons and weapons-grade materials. The innocent-looking, unmarked 18-wheeler trucks have special equipment to immobilize the entire rig in the event of attempted hijacking. And they are constantly tracked by satellites. The trucks travel in convoys with armed guards. They have logged more than 100 million miles in the past half-century without any loss of radioactive material, Giusti said. "It's not as if we don't know what we are doing," Giusti said. The material will be sealed inside two welded steel cans with packing materials inside a steel drum "and certified to prevent criticality and be suitable for safe storage until disposition," according to DOE spokesman Joe Davis. Greenville's Fred Giffels, chief executive officer of the nuclear engineering firm HGP Inc., believes the DOE's 1997 plan to convert the plutonium to mixed-oxide (MOX) commercial reactor fuel is a good one. Under the plan, the weapons-grade plutonium would be converted to MOX fuel at SRS, then used in reactors such as Duke Energy's McGuire or Catawba stations to generate electricity. Giffels said that plan would produce a benefit for South Carolina consumers in addition to taking the plutonium out of the weapons stockpile. But Giffels, who describes himself as a political independent, said it is unclear whether the Bush administration remains committed to the MOX plan. He said Gov. Hodges should obtain assurances from Washington before he drops his opposition to the plutonium shipments. "If plutonium falls into the wrong hands, it's not just the potential bomb effect; it can contaminate air and water. Gov. Hodges must insist that the state has a voice in the plan, and that there is an exit strategy," Giffels said. He said Bush might start by putting a technically skilled person at the helm of the Department of Energy. Not all experts are as confident that current plans will work. Arjun Makhijani, president of the private, nonprofit Institute for Energy and Environmental Research, says the plutonium waste at Rocky Flats exists in highly unstable forms. He said DOE has a poor record of keeping its promises, and the plutonium should be kept where it is and stabilized for another generation until the science of plutonium disposal is better understood. Makhijani, who has a Ph.D. in nuclear fusion from the University of California-Berkeley, said DOE's nuclear cleanup decisions have been driven more by politics than by science. Local and state governments have been romanced for two generations by promises of jobs and the economic boost of nuclear weapons plants. In South Carolina, entire towns were relocated, and cemeteries unearthed to clear the 310-square-mile Savannah River Site in the 1950s. Today, SRS is one of the state's largest employers, with about 13,000 jobs and $1.2 billion of annual spending. "We don't have a national cleanup program. And DOE is not the institution to exercise the leadership because it does not command the respect of the people or the technicians," Makhijani said. "It's very political and there's no politically acceptable solution for nuclear waste. You can't talk with confidence about a quarter-million years." DOE spokesman Davis said the agency remains committed to the 1997 plutonium disposal plan, and reaffirmed that commitment as recently as last year. "We are committed to getting Rocky Flats cleaned up, as well as other sites around the country from Oak Ridge, Tennessee, to Savannah River Site," Davis said. "We believe that Savannah River Site has the expertise and facilities to clean this up. The folks at SRS know what they are doing and we don't have that capability at Rocky Flats. But once it is brought to South Carolina and is converted into a safer form, it will leave South Carolina," Davis said. Now, Gov. Hodges fears budget cuts mean two plants to convert the plutonium will not be built at SRS, as promised. "If this stuff is so great, why do the people in Colorado want to send it to us?" Hodges said. 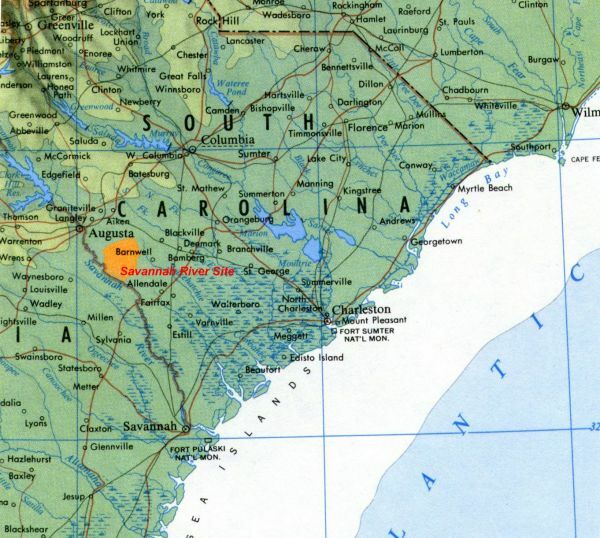 Figure 1- Map of South Carolina showing the Savannah River Site in orange. Hodges said the Department of Energy plans to ship an unspecified amount of plutonium from its Rocky Flats, Colorado, facility to the Savannah River Site near Aiken. DOE plans to close the Colorado facility to save $600 million. Hodges said he is prepared to do "everything necessary" to prevent the shipment unless a permanent storage plan is approved or the material is converted to fuel for commercial nuclear power generators. The Democratic governor wouldn't specify what he thinks are his options. But he noted that an Idaho governor once set up Highway Patrol roadblocks at the state line amid a dispute with DOE over shipment of nuclear materials. U.S. Department of Energy spokesman Joe Davis responded that DOE is fully committed to addressing Hodges' concerns, and crafting a long-term disposal plan for the plutonium. But he declined to commit the department to previous plans to either encase the weapons-grade material in steel and glass, or to use it as fuel in commercial nuclear reactors. Either plan aims to render the material useless for future weapons production. "There are no magic bullets here and the issues won't be resolved overnight. But we're committed to achieving a clear strategy to deal with plutonium," Davis said. "It's a shell game," Hodges said. "They clean up plutonium by moving it around. But the pea is going to end up in South Carolina." "People may say in Charleston or Greenville, why should I care? Well, folks, it's going to be coming by your house and on your highways to get to Aiken," the governor said. Hodges said the stony silence he has encountered in inquiries to U.S. Secretary of Energy Spencer Abraham make him suspicious that the Bush administration is quietly planning to concentrate all of the 30 to 40 tons of plutonium scattered across nuclear weapons facilities nationwide in a single state -- South Carolina. Hodges met with Abraham in Providence, Rhode Island on Monday, and Abraham is due to tour SRS today. The DOE spokesman said Assistant Secretary for Environmental Management Jessie Roberson plans to meet with Hodges' aides today. And Abraham will address SRS employees this afternoon. U.S. Sen. Ernest Hollings said last month on the Senate floor that "South Carolina was promised that this plutonium would only be treated at SRS, not stored for a significant amount of time." Hollings said he blames the Bush administration "for providing a budget that is woefully inadequate to provide for plutonium disposition activities at Savannah River." "If an agreement cannot be reached, you can rest assured this will not be the last time this issue is raised on the Senate floor," the Democratic senator said. Hollings has amended the energy appropriations bill in Congress to restore $159 million for clean-up at SRS, his spokesman Andy Davis said, an amount that would maintain the current clean-up schedule. Hollings told the Senate last month that Bush's proposed budget cuts would delay one plutonium disposition program "indefinitely." Hollings submitted an amendment to require a DOE plan to dispose of the plutonium in consultation with the state of South Carolina. U.S. 5th District Rep. John Spratt has offered an amendment that would require DOE to pledge a definite plutonium disposal plan and timetable before shipping the material to South Carolina. "The Rocky Flats plutonium has been scheduled to come to South Carolina for a long time. I just want DOE to have an exit strategy. I basically want to keep them honest," Spratt said. Long-term solutions are to either "immobilize" the material for permanent storage elsewhere, or to convert it to mixed oxide (MOX) fuel that can be used as fuel in commercial nuclear power generators. Either strategy, renders the substance useless for future use in nuclear weapons, and reduces its danger to the population. Hodges said the Clinton administration's disposal plan "was good news for SRS, because they already were dealing with the clean-up of the vestiges of the Cold War. It would give them new jobs and a new mission. We were okay with that option." Remnants of the plutonium would have been shipped to Yucca Mountain, Nevada, for permanent storage, under the Clinton administration plan. "Now the Bush administration has sent word they are having second thoughts about the MOX fuel process, and has cited questions about the immobilization option. In addition, they plan federal budget cuts for clean-up operations already under way," Hodges said. "It worries me that we may see these shipments of plutonium to South Carolina, without the Yucca Mountain issue unresolved. And with Sen. Harry Reid, the senator from Nevada who is the No. 2 Democrat in the Senate said he would keep it from happening, my fear is they will ship all this plutonium here with no finality or definition for converting it." DOE spokesman Joe Davis said there are no conditions on the suspension. But he said the agency hopes an agreement can be reached soon so cleanup of the nation's Cold War nuclear weapons complex can continue. Gov. Jim Hodges, who said he will mount Highway Patrol roadblocks if the plutonium is shipped here without such an agreement, said after Friday's announcement that he wants the pledge in writing. "If they will sign a binding agreement with us to keep plutonium out of our state until we arrive at mutually agreeable terms, then we will postpone the exercises next week. But if they don't sign an enforceable agreement, then we must be prepared to protect the health and safety of South Carolinians," Hodges said. The DOE had been firm in its plans to ship plutonium to SRS in mid-October until Hodges began to threaten the roadblocks. Hodges has scheduled a practice exercise Wednesday near SRS. DOE's announcement came following a meeting late Friday between Robert Card, DOE undersecretary, and South Carolina's House Speaker David Wilkins and Lt. Gov. Bob Peeler. The SRS Be Turned Into A Nuclear Dumping Ground? Strifes will arise throughout the period. Watch for them near Davis Strait in the attempts there for the keeping of the life line to a land open. Watch for them in Libya and in Egypt, in Ankara and in Syria, through the straits about those areas above Australia, in the Indian Ocean and Persian Gulf. Ye say that these are of the sea;yes, -- for there shall the breaking-up be, until there are those in every land that shall say that this or that shows the hand of divine interference, or that it is nature taking a hand, or that it is the natural consequence of good judgments. But in all of these, let each declare Whom ye will serve: a nation, a man, a state, or thy God? For to Him ye must look for comfort that ye know that comes. All that is of a temporal nature, this -- too must pass away; yet there remains the comfort for those who declare themselves, "Let others do as they may, but as for me, I will serve the living God." The bold italicized section offers three models of understanding Earth changes: divine intervention, nature taking a hand, and the natural consequence of good judgments. Let's consider "nature taking a hand." "When you have pollution in one place it spreads all over. It spreads just as arthritis or cancer spreads in the body. The Earth is sick now because the Earth is being mistreated, and some of the problems that may occur, some of the natural disasters that might happen in the near future, are only the natural readjustments that have to take place to throw off sickness.. A lot of things on this land are like viruses or germs. Now, we may not recognize the fact when it happens, but a lot of the things that are going to happen in the future will really be the Earth's attempt to throw off some of these sicknesses. This is really going to be like fever or vomiting, what you might call physiological adjustment." ".... unlike some foreign gurus who claim they know the exact day and time [of the Day of Purification]-- I can't say exactly when it will occur. .... I've had visions of the planetary cleansing, and it's truly a horrible thing. Unlike the natural disasters of the past -- which involved either fire or water, -- this upheaval will involve both fire and water. Cities will be reduced to rubble, and most of the few survivors will turn on each other violently. The whole thing will take some time though. There actually will be 40 years of purification...."
In a more European, yet metaphysical rendering, we have Rodney Collin's concept from his 1954 book, The Theory of Celestial Influence, that the different natural realms of Earth have their centers of gravity in different periods of the table of elements. "We may suppose, for example, that the true home of the unnatural radioactive elements of period 7 is in the inert core of Earth." According to Collin, man's activities in his gathering together of radioactive elements on the Earth's surface, and his creation of trans-uranic elements for his own destructive purposes, represent a violation of Nature's design. Indeed, excess plutonium, the chief man-made explosive ingredient in nuclear weapons, has been piling up worldwide until now there are around 1,500 metric tons at scattered points over the face of the Earth. And to this we can add the global distribution of thousands of more tons of legal and illegal uranium-235 and -238. To those attuned to the cosmology of Rodney Collin, Nature herself may rebel at such an imbalance, because such radioactive materials belong to deeper realms of the Earth, and because man's creation of the infernal matter of nuclear bombs courts natural disaster. the Nevada Test Site in southern Nevada (northwest of Las Vegas), where repeated underground (and above-ground) nuclear bomb testing has left huge quantities of plutonium, cesium, and other radioactive material underground, and radioactive fallout has spread far beyond the test site. Interesting, isn't it, that two of these locations (2 and 4 above) of concentrated radioactive pollution that began to be generated about 1943-1945, coincide with parts of the U. S. ("the southern portions of Carolina, Georgia" and "the southern portions of Nevada," respectively) that were said clearly to be due for Earth changes in readings given prior to 1943? And the other two locations are in either the western portion of the U.S.  where the land will be "broken up" or, as with location 1, near the Eastern Tennessee Seismic Zone where the release of seismic energy is currently higher than anywhere else in the eastern U. S.